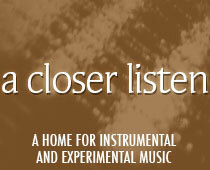 The title of Lo Tide‘s new EP, Closed to Listening, seems the direct opposite of our site’s name. And yet the title is likely meant in an ironic way, as the EP is noticeably open to new electronic styles. The set follows on the heels of the Australian artist’s album A Belief Too Far, which includes the instrumental track “Hustle”, just featured in our article, 10 Tracks to Start Your Summer. Unlike the album, the EP is fully instrumental, save for the occasional sample; but like the album, it provides a rush of pleasant summer beats. “In Reverse” begins with a deep bass and rhythmic beats, later adding whistle-like yelps, melodic guitar, piano and video game swirls. It’s the obvious choice for a single. As each element is added, the track grows increasingly lush, until it ends with a sound like the felling of a tree. Molo’s remix substantially deepens the bass, highlighting the track’s lowest tones. This makes the piece a perfect window-shaking track for a low-speed ride. At 2:20, the timbres shift; flowing water and bell tones emerge, elevating the appeal. This is the best sort of remix, respectful to the original but a different animal. Sun Glitters chooses to highlight the piano and percussive sounds, again offering a fresh take on the original ~ so fresh, in fact, that the tracks can be played back-to-back without over-familiarity.